Hello all players and parents! My name is Vaibhav Naidu, and I am currently a junior and varsity soccer player at Dougherty Valley High School. Soccer has been a personal passion for me since I was 6 years old, and has largely shaped me into the person I am today. I now hope to share a similar gift with the youth of this generation. 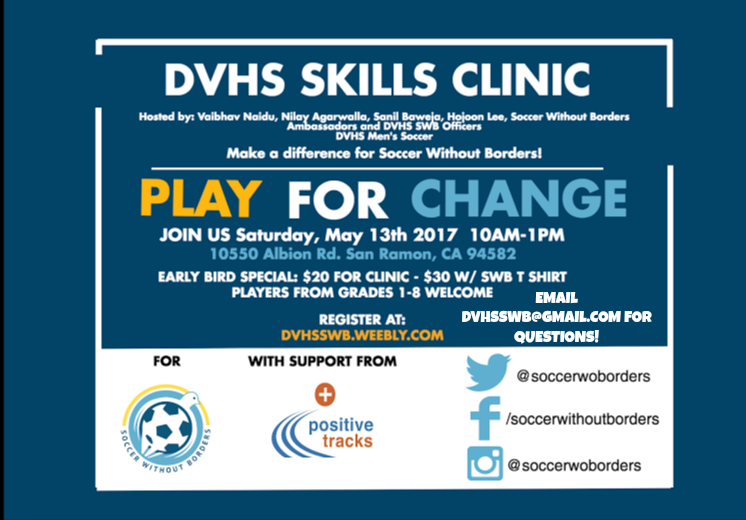 My friends and I started the Soccer Without Borders club at DVHS, with the hope that we can coach kids in the immediate community, as well as raise money to provide equipment and coaching for eager players without the same opportunities that we were given. Our club is currently hosting a clinic this weekend from 10-1 on Saturday, May 13 at the Dougherty Valley High School. The price to participate is $20, with an additional $10 for a Soccer Without Borders t-shirt! 100% of the proceeds go towards helping underprivileged kids, and the organization Positive Tracks has agreed to match the value of our donations. Please sign up and spread the word! Check out our flyer (attached below) for clinic details. Visit our website (dvhsswb.weebly.com) or contact me(yb.naidu8…@g…com) for questions.